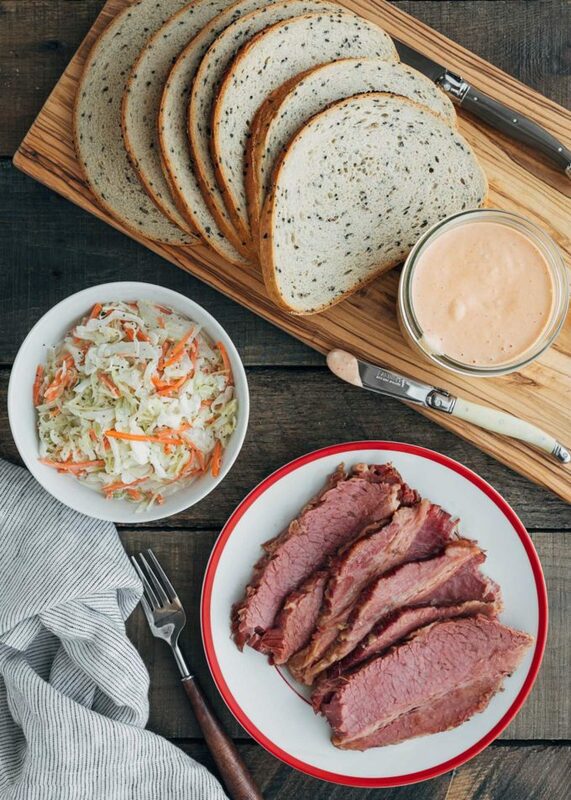 Thin-sliced corned beef meets coleslaw and Russian dressing for a taste of the deli experience at home. 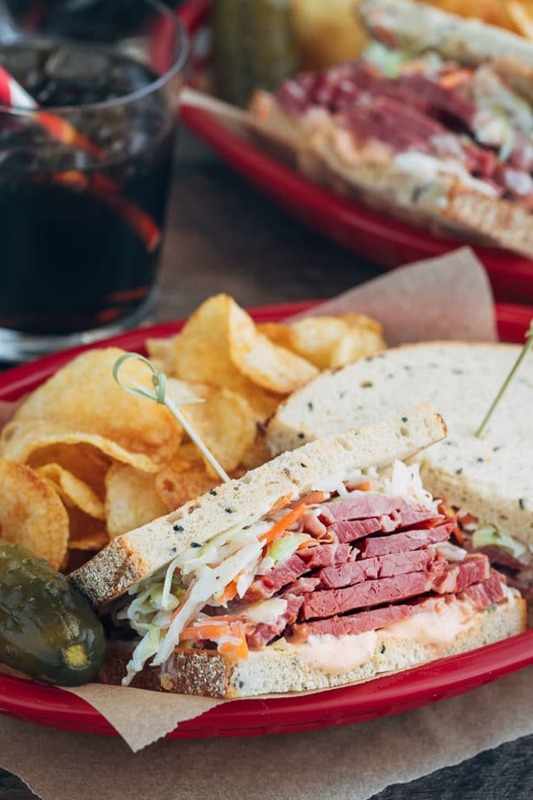 This Corned Beef Sandwich is perfect for a game day party, casual party trays, and lunch the day after a corned beef dinner. For this Jersey girl, there are few lunches that give me the nostalgic feels more than corned beef sandwiches. 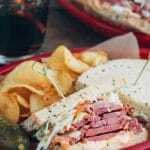 Whether it’s an ooey-gooey Reuben, a tower of warm corned beef on rye deli mustard, or this cold sandwich with coleslaw, corned beef sandwiches are a diner and deli staple in my neck of the woods. For me, the cold corned beef sandwich combines the characteristic flavors and textures of “deli” the best. The cool crunch of the coleslaw. Salty, tender meat. Tangy, spicy Russian dressing slathered onto chewy, earthy rye. Like most sandwiches, this recipes is more of a guideline than instructions to follow to the letter. You can layer the sandwiches in any order, with as much or as little of any ingredient, as you like. That said, there are a few factors to consider to make a corned beef sandwich that tastes like a trip to the deli. The first is the corned beef itself. For the true deli experience, slice the corned beef against the grain, on the thin side. If you’ve made my Instant Pot Corned Beef or Beer-Braised Corned Beef, use a sharp knife and aim for slices 1/16- to 1/8-inch thick. It’s easiest to get thin slices when the brisket is cold. Really thin slices are difficult to achieve at home without the meat slicer that they use at delis. If you want to pile your sandwich high with shaved corned beef, time to pay a visit to the deli counter! I like to start the sandwich with homemade Russian dressing on the bottom slice of the bread, followed by the corned beef, and then a goodly amount of coleslaw. Both the Russian dressing and the slaw dressing will soak into the bread a bit, so it’s best to serve these sandwiches soon after you’ve assembled them. What Type of Rye Bread Should I Use? You can make these corned beef sandwiches with any type of rye bread available to you. My favorite rye bread is Jewish rye (or “deli rye”) with caraway seeds. It has a dark, chewy crust, dusted with cornmeal, and light-colored interior. At the grocery store, look for rye bread sold in front of the deli counter or in the bakery section. I find that some of the commercial ryes in the bread aisle aren’t as substantial in texture. They tend get a bit soggy from the dressings in these sandwiches. For an interesting read about rye bread, check out, What Makes Rye Bread Jewish?, from My Jewish Learning. Serving The Best Corned Beef Sandwich: Don’t Forget the Sides! 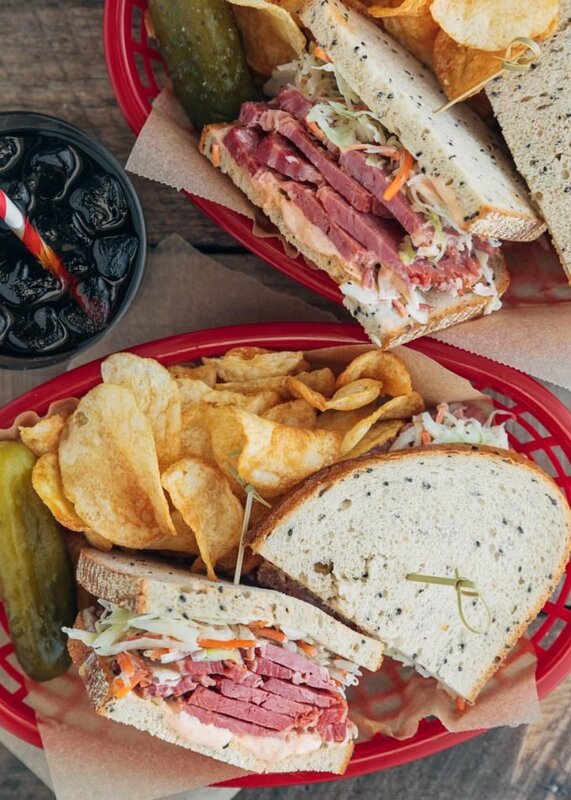 To complete the deli experience, corned beef sandwiches wouldn’t be complete without “kosher” dill pickles and chips! I put quotations around kosher because in deli-speak, kosher pickles aren’t necessarily prepared according to kosher dietary laws. Here, the word refers to the pickle style. In the New York and New Jersey regions, kosher pickles are fermented in a salt brine with garlic dill, and spices. Most of the time, the solution is a natural brine and does not contain vinegar. Kosher pickles can either be half-sours or full-sours. Half-sours are brined for less time than full. They have a softer flavor, brighter green color, and crisper texture. Pick whichever dill pickle you like best! I also love to serve these corned beef sandwiches with crisp kettle chips and a cold bottle of cola or cream soda. Deli done right! 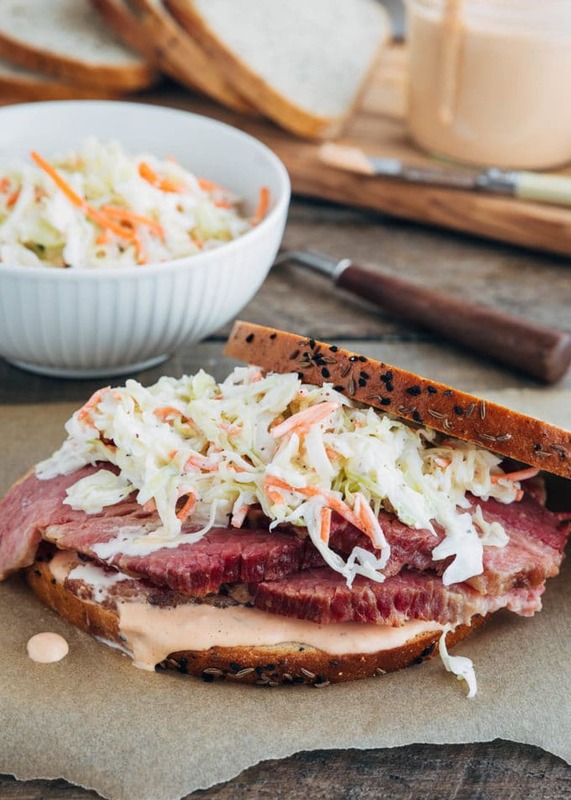 This cold corned beef sandwich, layered with Russian dressing and coleslaw, is a New Jersey deli classic! Spread Russian dressing onto two slices of rye bread. Layer with corned beef and coleslaw. Top with the remaining slices of bread. Cut each sandwich in half and serve with pickles and potato chips. *The ingredient quantities in this recipe are a guideline. Feel free to layer your sandwich with as much (or as little) of each ingredient as you like best, depending on the size of your rye bread slices.